Gold-tone filigree covers the front of this beautiful Ornate Bejewelled Hairclip. Opulent, crystal accents and a large oval faceted faux gem adorn the front. 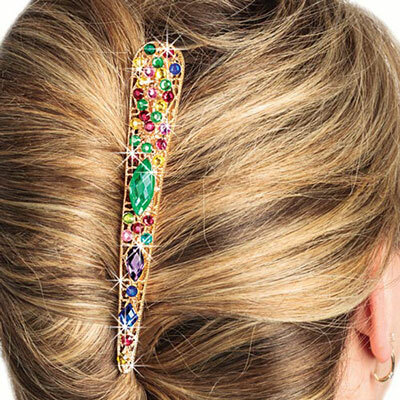 Spring-action, alligator-style Ornate Bejewelled Hairclip is ideal for a variety of twists, half-up styles and more. 5½"l.
I absolutely love this hair clip. Every time I wear it I get SO MANY comments and compliments on it! People think I've paid a fortune for it, it just looks so good. I've had it for 2 years now and although it's showing some wear it still works great.